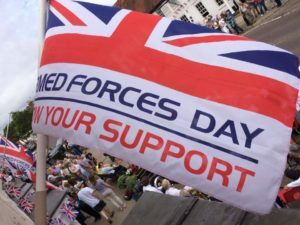 So, we’re a week on, the weather has turned chilly and wet but that hasn’t put a dampener on the spirits of all Odiham-ites, having celebrating another successful Armed Forces Day on 24th June! 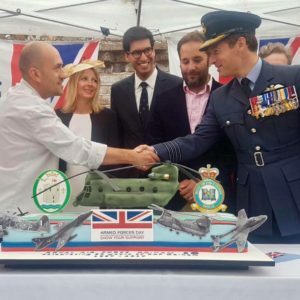 After cheering on the traditional forces parade and enjoying the exhilarating Chinook fly-past, visitors spent an afternoon lobbing unsuspecting teddies from great heights and tasting the delights the various food stalls and vendors had on offer. 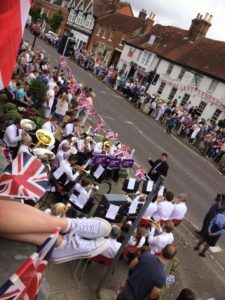 Bands in the Bury kicked off an evening of musical talent and the evening’s revelry’s certainly helped to support the view that Odiham Rocks! 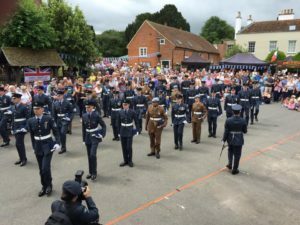 The day’s proceedings began in the High Street, street wandering accompanied by the Cove Brass Band, followed by the RAF Parade and Chinook Fly Past. 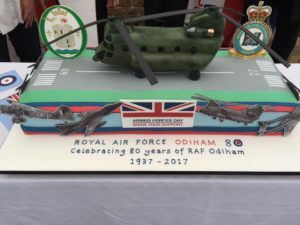 Then RAF Odiham were presented with their 80th Anniversary cake- a stunning Chinook replica. Bands in The Bury brought three new exciting acts to the stage this year, alongside firm favourites, busker Pete Westbrook and the familiar Rollright Stones to close the day. Returning to close this year’s party, this 4 piece band are no strangers to The Bury. Bringing rock, blues and dance cover favourites from the 50’s to the present day, the Rollright Stones rocked the finale of the party. Our resident wandering minstrel returned to provide another year of entertainment! Huge thanks go to everyone involved in the production, planning and preparations for the day and for those who came along to enjoy the fruits of all of that labour! 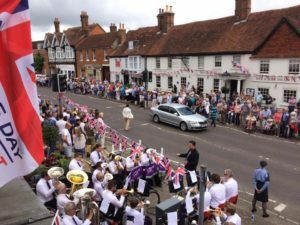 Armed Forces Day and Band’s in the Bury, was, as always, a resounding success for Odiham and we look forward to beginning preparations for next year’s celebrations!